An original Porsche 356 Speedster will cost you over $200,000 in good condition. This puts it well out of the reach of most enthusiasts. Because originals have continued to skyrocket, it has opened a market for replicas to be built. These cars feature a fiberglass body on a chassis from a Volkswagen Type 1 and powered by an air-cooled VW flat-four engine. The advantage to a replica is that you aren’t as worried about it getting damaged, making it more likely to be driven regularly. You can also feel free to modify the car to your liking. Some of these kit cars have working air-conditioning and hot rodded engines. All this in a package that the average person will think is the real thing. For about $40,000 you can buy one of these replicas and get the kind of attention normally reserved for Ferraris and Lamborghinis. Now at that price you can get an original air-cooled Porsche 911 from the 80’s. The 912 will likely appreciate in value, unlike the replica. A kit car is not an investment, but it does offer much of the experience of the original without the worry of wrecking your valuable machine. 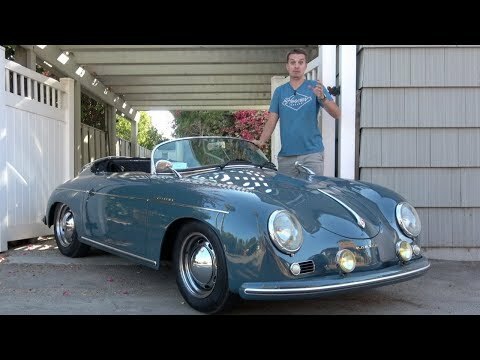 Check out the below video to see what a Porsche 356 Speedster replica is like to drive. After you watch the video, scroll down to the comments and let us know if you would buy a 356 replica or a 911 for about the same price.